Several years ago I was on safari in Kenya near Amboseli photographing elephants as they walk across the dry lake bed towards a water hole - laying on the ground I found this frame which I finally think I have rendered the way I want it. Comments are heartily encouraged - I try to learn something from every one! I like it. You've captured what looks like slow, deliberate movement, and the sky behind them is wonderful. In a perfect world I would have preferred more space in front of the elephant on the right, but the capture of two of these beasts is wonderful. I think that is exactly what they were doing - no real hurry, but no detours or deviations - just a straight line to the water hole. Thank you , Denise! An awesome perspective and some very dramatic sky here. I wish the elephants had a little more exposure (although I don't know about the lighting conditions on that shot), because it's somehow the sky that is drawing my attention more than those beautiful animals. Maybe raise up some of the shadows in the elephants using some kind of advanced masking or darken the top of the sky a little? 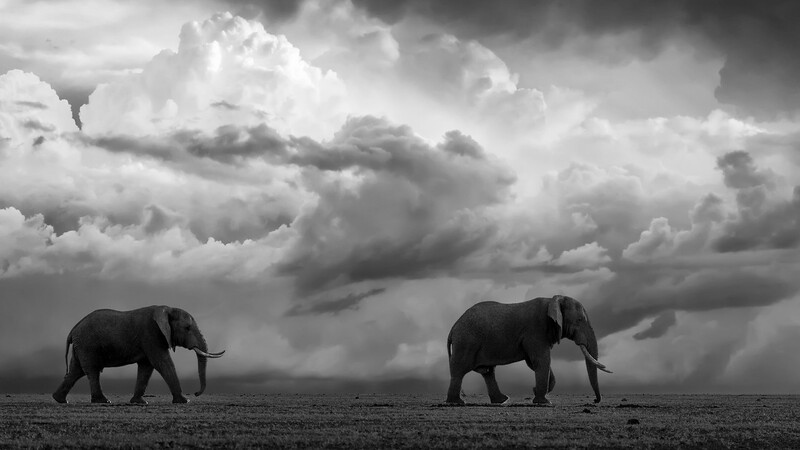 Thank you for your suggestion, I have thought at some length whether the ellies were just a smidge too dark against that dramatic sky and thought I’d post it as it is and see if anyone called me out on their tonality. I do have a mask for them and I can lighten them just a touch, and then I might just ever so lightly darken the foreground grass as well. It will take me a few days as I am currently travelling, but sometime this weekend I will post a revised edition and we can see which the readers here prefer. Again, thank you for your comment. The highlights are all literally on the ground.....all their toes are lit up and somehow the area under the paws is lit up......sun was low? Having said all that.....these are the kind of images I dream of creating! The more time I spend with this wonderful image the more I appreciate your choice of rendering and posting it as is. I find that there is more than enough light on the elephants to compliment the lighting and emotional impact the incredibly dramatic sky provides. I appreciate the subtle slivers of sunlight on the forehead, portions of the ears and around the feet of these magnificent elephants. Wonderful. This image might also serve as an excellent candidate for an additional black & white companion image. I always enjoy viewing your excellent and inspirational work! 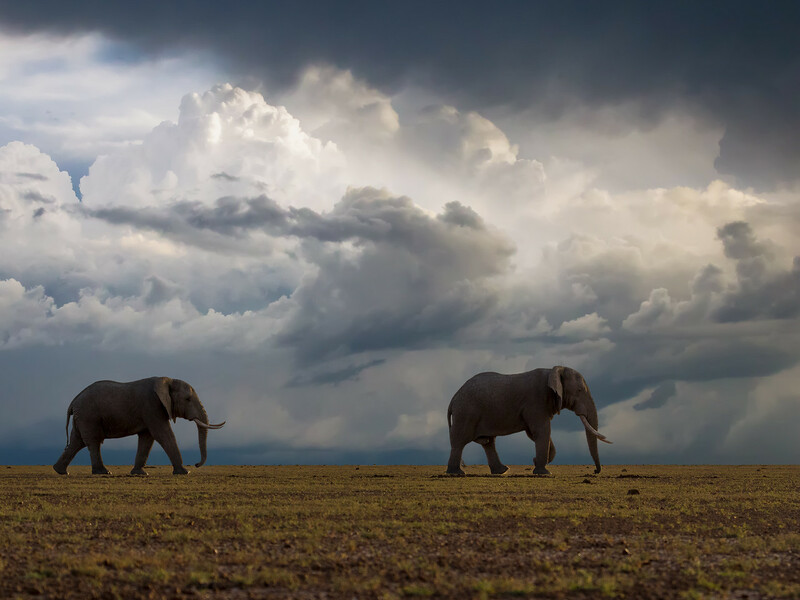 I find that there is more than enough light on the elephants to compliment the lighting and emotional impact the incredibly dramatic sky provides. Nailed it. The contrast of the elephants against this killer sky makes the shot, and lightening the elephants would only diminish that. Another hour or two and this would be a silhouette and that would work too. We don't need to see all the details of the elephants, just observe them in this incredible space and doing what elephants do. I finally am back home and went back to my files the elephants walking before the storm - and I have a newer version with ever so slightly brightened highlights on the elephants and a darkened foreground - not a big change, but slightly better without altering what was nice about the first image I believe. I think how well the first image is liked, depends to a certain degree on the brightness settings of the monitor it is viewed on - I like it on my LG HD monitor, but it does seem a touch dark on my Ipad but not on my HDR LG TV - so there's that to think about as well. Anyway, here is my slightly revised version which I think may be slightly more interesting than the first- mostly in the highlights on the tusks and ears. Tony, I’ll try monochrome a bit later when I have more time. Reworked to near perfection! Bravo Jim! Now attention is away from fg.....the light on Ellies drawing attention to them.....and then once one has enjoyed them a bit....then eye wanders elsewhere to soak it all in! Here ya go, Tony, monochrome via Silver FX. Now which better?? - color or monochrome?? - I find it a very hard choice myself - both have things I like, but the monochrome works reasonably well I think. I really like this new version. Looks great. Fortunately, both versions can coexist quite amicably! If I were a collector of fine art photography and were to see both versions available for purchase in a gallery, I'd immediately select the monochrome. With the monochrome version the glorious interplay between light & shadow is especially in full display. Particularly because of the stunning effect monochrome has on the clouds I see the elements within this excellent photo as an equal celebration of the magnificent elephants and the dynamic environment in which they live. Congratulations on capturing this stunning and memorable photograph! Both great! Can't lose any! I printed both files this evening, and on paper, I do prefer the monochrome image - the color just seems less interesting when printed. I hope you printed them large enough! Even if you say that the color version looks less interesting than the monochrome one (and as a monochrome fan boy, I can totally understand that ;-)), I cannot imagine that the colored one looks not interesting at all. So you might have the monochrome version to hang up yourself, and the colored version as a great gift for someone else! Btw, I do love the subtle adaptions you did to the color version. And I can just agree to my predecessors here about the monochrome version - great conversion you did there. And of course, did everything right in the first place when taking the picture. Awesome! I printed them small on 8x11 in paper, and I preferred the monochrome image over the color one - I do think that the size of the print matters and that color might be better a bit larger, just not as compelling to my eye as the B&W. I take your compliments with great pride - I spent some time wandering through your galleries ( kurzvorzwoelf.com ) and you have a lot of lovely thought provoking images, a great many of which you have converted to B&W, so I see that you, too, like good monochrome images. Definitely an evocative scene to be part of and capture - but demonstrates the difficulty I've also experienced when taking pics in similar situations ie 2 subjects in frame. 1 subject can be placed wherever the 'tog wants it to be (provided competent enough) ... but 2 aren’t so easy re overall composition of the pic, because of other factors (outside the togs’ control) such as interaction / pose / separation distance etc. Here, for me, I think subject separation between the 2 eles is the main 'problem', because of the way it affects the composition of the pic. Light is fine, as is background – but ultimately, composition – and to a much lesser degree – pose introduce question marks against the final impact of the pic. In essence, I agree with Denise’s comment about more space on the rhs – but, imo it’d have to be a lot because of the degree of separation between the 2 subjects. Something I’ve tried in the past – and obviously doesn’t always work  - is to lock focus and pan in front of the ‘action’ to provide more bg frame (and composition) possibilities for stitching in post. Re cropping possibilities with the frame posted – if mine I’d consider trying (as I have done) something fairly drastic … Losing the nearer ½ to 2/3 of foreground and cropping the top dark bit of sky out. The extent of the latter would depend on whether you were prepared to get rid of the ‘finger of dark sky’ pointing to the rear elephant – or not – as that’s an EP (for me). In an ideal world – for this frame, halving the separation between the 2 (moving leading ele > L) would be a start. The frame seems to be 4:3 … what’s the story with that? Wow - well, it is 4x3 because that is the way the image needed to be to my eye, and so I cropped it that way - I did try wider, shorter crops but, for me, this image really needs the dark border at the top to off set the bright central sky. I have dozens of frames of this pair of elephants crossing the playa and for better or worse, they all seem to have about the same spacing between themselves, and within the frame.